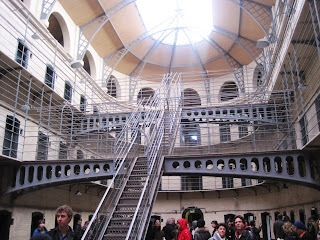 In lieu of classes today, we hopped on our familiar coach bus to take a trip to the Kilmainham Gaol Museum. 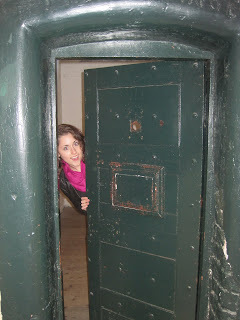 The jail was home to many a rebel and thief throughout the years of British rule, including many children. Basically any petty crime could get you locked up for months on end, including an eight-year-old girl who stole a cloak to keep warm on the street and a six-year-old boy who was caught on a train without a valid ticket. Some kids would actually try to get caught stealing loaves of bread because after being orphaned by the famine or political imprisonment, having the jail roof over their heads and three meals a day was a pretty good deal. 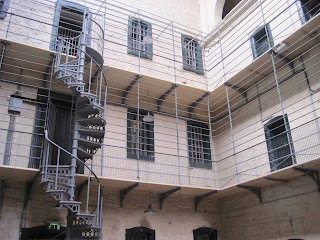 They also executed the prisoners here, and we got a chance to see the gallows. Eerie stuff. Unfortunately, I forgot to charge my camera so I had to bum pictures off Colleen, but she got some good ones so it all worked out. This iconic main area has been the set for over 70 movies, and the acoustics are so wonderful that U2 has even recorded here. It was an interesting trip, and a welcome break from classes. Then, we all came back to bang out our 2,000 word history essays. I'm finished in record time (at 1 a.m.) considering my procrastination impairment. And I'm not the last one awake! Hey, I'll take my victories where I can.